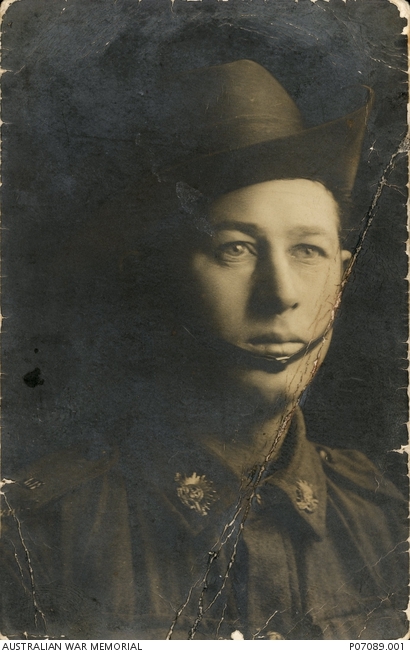 Studio portrait of 5157 Private (Pte) Roy Mitchell, 2nd Battalion, of Balmain, NSW (originally of Brisbane, Qld). A labourer prior to enlistment, Pte Mitchell embarked with the 16th Reinforcements from Sydney on SS Marakini on 1 April 1916. On 4 October 1917 he died of wounds at Broonseinde, Belgium, aged 21. Pte Mitchell’s brother, 4845 Pte Albert Edward Mitchell, enlisted in the 3rd Battalion on 9 October 1915 and was killed in action at Fromelles, France, on 19 July 1916, aged 23.